It can get really annoying while you are downloading an important file over your home internet and your bandwidth quota is over all of a sudden! This is especially taxing if you are a student or someone who has just started working and on a strict budget. Internet Service Providers (ISP) offer a fixed quota for uploading and downloading each month exceeding which can cost you premium charges. If you do not prefer paying any additional fees, you have to work with slow speeds which can really test your patience. In order to avoid low bandwidth speed like the dial-up ones, monitoring your internet speed is a great idea. Keeping a watch on the network bandwidth lets you point out any congestion, comprehending the true connection speed compared to the premium version while splitting up genuine bandwidth consumption from network usage of suspicious nature. Today we have the top free bandwidth monitoring tools that will help you monitor internet consumption. These are accompanied with some basic features that allow you to view the proportion of network data moving through the wired connection. This helps you ascertain the origin of the internet consumption within the confines of your network. A free and open source software, BitMeter OS is designed to monitor the bandwidth speed of Mac OSX, Windows and Linux. Using this tool you can keep a watch on your internet usage and even get a visual representation of the same through a command line tool or a by a web browser. You can view your internet connection usage via the different graphs and charts displayed on the web interface. The graphs get updated every second on the monitor and let you know where is your network getting used. There’s also a query window that provides you with in-depth information about network usage for any specified date. You can also get a spreadsheet of the results if you want. If you want to keep a track on your internet consumption changes in the last few hours, days or months, you can view this information on the History window. With the help of this tool, you can also set notifications and alerts when your bandwidth usage goes beyond the limit set by you. In order to calculate the time taken for downloading or uploading a file, or to check the data volume you can transfer in a fixed time period, you can make use of the calculator utility. To be able to customize the different functionalities of the web interface so that it fits your requirements you can access the Preferences window for the same. FreeMeter Bandwidth Monitor is a straightforward, lightweight and user-friendly tool that helps monitor and analysis your network speed. What’s good about this software is that it is portable and it allows you to see the real-time visual representation of any data (uploaded or downloaded). You can see the graphical display of all the network usage data on its main panel that’s being transported up and down on your network cable. It comes with plenty of simple yet useful tools like ping, Traceroute, URL grabber, UPnP NAT, email alert service and more. You can even customize its interface like, cycling colors, setting its darkness level, change the default frame, etc. Additionally, you can also check the application updates and log info. Once the installation is complete it sits in the tray hence, simply right-click on it and choose the option or just double-click on it to open the interface. Monitor internet traffic and keep a watch on the bandwidth usage statistics with ShaPlus Bandwidth Meter for a period defined by you. A small window pane on the interface displays the network traffic status for the current day and the entire month. For more information, you can go to the icon in the system tray. 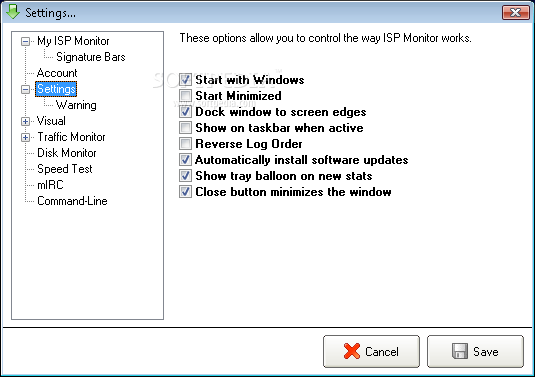 If your computer has numerous multiple adapters installed, you can configure the network interfaces from the settings menu for monitoring purposes. Moreover, if you use the unlimited night data plans, configuring the start day of the month and an interim to deactivate the monitoring activity of the network traffic can be especially useful. This handy software is smooth on the hardware resources and also allows the system to perform perfectly. With its intuitive interface, it offers the convenience to be installed by both beginners and experts alike. 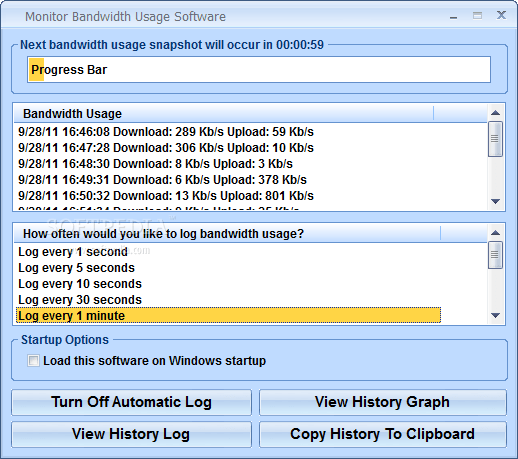 BandwidthD is another freeware that runs separately in the background and facilitates monitoring of the internet (TCP/IP network) consumption. The results for the bandwidth usage, in form of HTML files, are then displayed in form of graphs and tables on the interface. Different IPs form the graphical representations and exhibit the 2day, 8day, 40day and 400day periods usage by default. Moreover, the usage display of each of the IP address can be logged out every 3.3 minutes, 10mins, 1hr or 12 hrs. These log outs are available in cdf format or can be exported to a backend server. The traffic information in P2P, HTTP, ICMP, TCP, VPN and UDP are color coded. In order to install this program, you need to have Wincap version 3.0 or above. To be able to view the graphical representation of the bandwidth usage you need unzip the BandwidthD, edit the configuration file (../etc/bandwidth.conf), run the batch file for “Install Service” and then launch the BandwidthD app from the services.msc console. Free to download for up to 30 sensors, PRTG Bandwidth Monitor is an integrated part of the PRTG Network Monitor. A sensor can be any item like, a router, website, network interface and more that can be set up accordingly to be monitored. As soon as you organize a sensor to keep a watch on your bandwidth speed, it starts collecting information straight away. PRTG, on the other hand, evaluates the traffic in your network and offers you comprehensive information in form graphs and charts. It offers a great download speed which compels your network monitor to run in a matter of minutes. PRTG not just guarantees a smoother server performance and avoid network congestions, but also monitors added frameworks like upload time, response time and much more. PRTG is one such free tool that supports more than 200 different varieties of sensors along with bandwidth monitoring and network analysis. To go to the bandwidth monitor page for the specific sensor navigate to the option “Devices”, select “All” from the menu bar at the top and then choose the desired sensor. You will then be directed to the Overview page for the sensor in question. 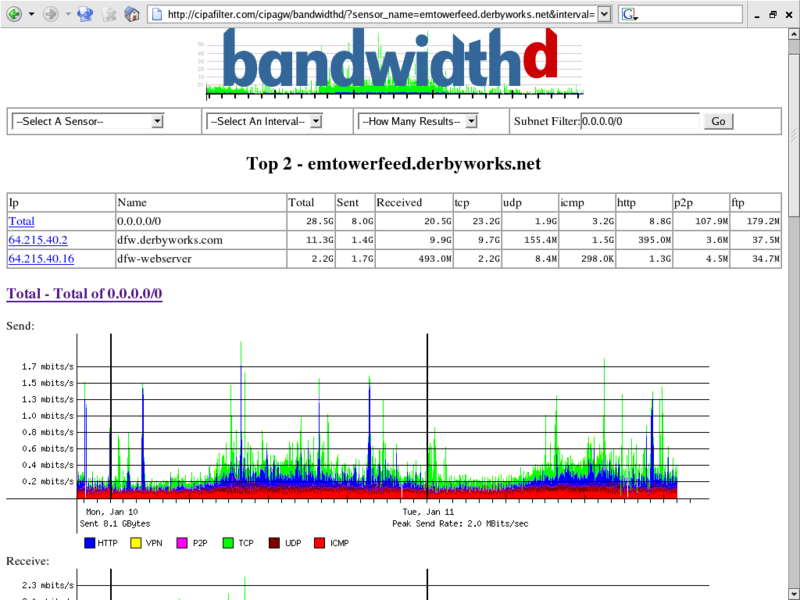 Here you can see the bandwidth details in form of charts, graphs, and tables indicating the traffic to and fro. Compatibility: Windows, Linux, Oracle, Citrix and more. 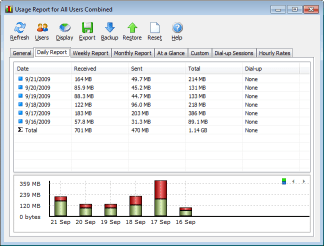 Monitor Bandwidth Usage Software is a frivolous tool for Windows that helps keep a track of your network consumption. It comes with a neat and responsive interface where you can most of the activities without any hassle. The software is quick and efficient enough to record the monitoring function starting from one second to 24 hours. Not just that, it also displays the history of the network usage (viz., upload and download speed) using graphs or straight into the main window. Using this freeware you can also enable or disable the automated log action, view the record log containing info related to all functions in plain text format, and copy the past record to the clipboard. Moreover, you can even remove the records in just one simple click and let the application launch when the Windows starts. The best part is that even beginners can access this tool with ease with its easy to use features. Monitor Bandwidth Usage Software is pretty fast with no errors during the entire process. Considering that it does not leave behind many traces, the overall performance of your PC is also not affected. If you are looking for a simple yet compelling tool that helps you to monitor your bandwidth usage fairly, NetWorx is just the right tool for you. Collect network data and compute the speed of your internet or any other connections using this tool for free. Using this utility you can find out any potential reasons for the network issues, confirm that the bandwidth limit is not surpassed beyond the specified limits set by the ISP, or you can even bring into light any doubtful network activity like Trojan horses and hack attacks. While you can monitor Wireless or Mobile broadband network with NetWorx, you can also customize sound and visual notifications. The notifications can be created to alert you whenever the internet is down or if there’s any dubious activity noted for example, occurrence of unexpected excessive data flow. The program also disconnects all the dial-up networks automatically and shuts down the system. View the daily, weekly or monthly network data usage and dial-up period on the line chart that displays the traffic movement. You can also export these log reports into different formats like MA Word, Excel and HTML. The program sits as an icon in the system tray after it’s downloaded and installed. Right click on the icon to open up the menu that offers option to control the tool. On left-clicking the icon you can view the current status of the program. Ping, traceroute and netstat are some of the network tools used by NetWorx. The best part is that this program is available to download in multiple languages. 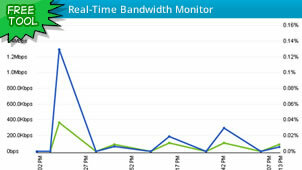 If you are using SNMP based devices then SolarWinds Real-Time Bandwidth Monitor can be your ideal tool. This freeware helps monitor real-time and exhibits the outputs in form of graphs that are easy to understand. It allows you to fix vital and alarming criteria to view whenever the consumption exceeds the set limit, instantly. On launching the program you need to enter any information related to the SNMP based device and then hit “Next”. In the next step, you will be asked to select which layouts to be joined and which criteria should be fixed before the appearance of the graphical representation. So for example, if you send two individual print jobs from your SNMP based network printer, you will be able to see two separate green lines depicting the traffic into the device. NetSpeedMonitor is network monitoring utility that helps you to keep a tab on your internet connection at all times. It’s a compact and lightweight software that monitors the current upload and download speed of your network connection so that you can keep a track of the data volume transferred. You can view the network usage data for either a day, or for a complete month. It comes with a straightforward interface and a neat design which makes it easy to use by users. You can not only view the comprehensive list of all the system endpoints (TCP and UPD), but also the local and remote addresses of the TCP networks along with their status. You can turn on and off the monitoring procedure at any given time from the menu that can be handled from the system tray. There are added settings available using which you can view the complete volume of internet data transferred and received for a single day for each network interface. 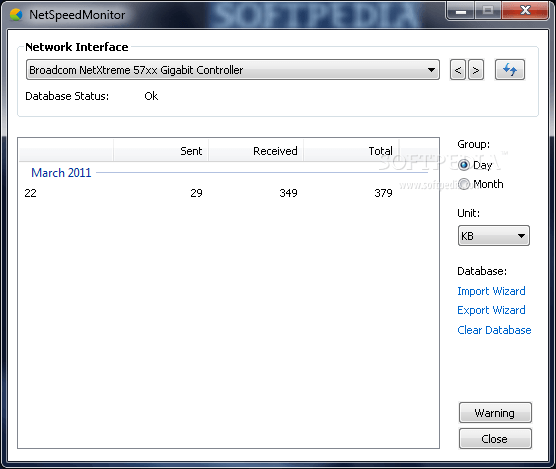 You can also customize the NetSpeedMonitor interface using the several options like, font name, size and position. Overall it’s a simple and handy program that does not require much learning curve and can be installed and customized easily. 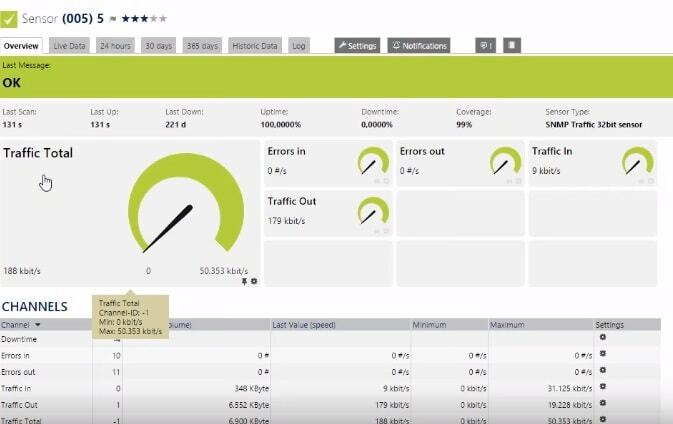 Monitor your network connection speed with Rokario Bandwidth Monitor which is available to download for free (premium available) and is lightweight. It displays the network data information in real-time via graphs and bandwidth reports. On launching the program you are straight away asked which interface you want to be connected to? This follows with the launch of the graph on the desktop and it instantly begins showing the network speed information. If you want to change the interface settings, or of the network data or the looks, you simply need to right click on the icon in the system tray and choose settings. The free version comes with theme designer, options to customize, real-time database, Display settings, and bandwidth logging while it utilizes extremely low resources for the actions. Overall, Rokario Bandwidth Monitor is easy to operate, can be easily installed, configured and customized, and provides accurate monitoring data. Track your broadband consumption efficiently with Cucusoft Net Guard which is free to download. It also helps boost your internet speed and removes any suspicious software that might be using your internet discreetly. Additionally, it offers you a monthly report for your Bandwidth usage for free. It eliminates the entry of any adware, spyware or virus. The software features a small sized floating pane (real-time) that shows the upload and download speed of the internet in real-time. You can choose to either hide the pane or can adjust its opacity to make it more transparent if required. You simply need to right click on the floating pane. Now, click on the “Opacity” option and then choose the opacity level you wish. You can now see the floating pane turning transparent. You can also set up a monthly limit for internet traffic using the “Forecast” feature. This option calculates the predicted bandwidth for a month automatically, therefore, helping you to figure out whether the monthly consumption limit has exceeded. ManageEngine Bandwidth Monitor offers real-time support for the monitoring of the network traffic if any SNMP based device. This program constitutes a section of the OpUtils suit of the 16 network tools. The free version of the program allows two connections of any network device that helps SNMP to be tracked. You can fetch the bandwidth consumption info on both at the device level and at interface-level. You can view the comparison of the separate traffic of its interfaces displayed by the bandwidth usage of the device. It also offers other features like notifications, facility to export the reports in XLS format and a mode of operation without any agent. When the web interface starts and you log in, you will need to visit the tab that says “Bandwidth Monitor” and enter an SNMP based device along with its analogous interfaces to start the monitoring process. Now, you can click on the interface to go deep beneath and view the detailed statistics in form of graphs in real-time. You can also view the network data daily, monthly or annually if you wish. If you want something lightweight that can help you keep a track of your internet speed effortlessly, you can certainly make use of this free tool named, ISP monitor. It helps you get the real bandwidth speed that you actually pay for. It provides you with network traffic monitoring in real-time while the integrated traffic monitoring feature shows the ongoing network speed using 3 individual graphic modes. What’s great here is that all the three modes can be customized to suit your needs. The program also shows the percentage of data used from your total limit and allows tweaking it before it reaches the set limit. You can set the upload and download limits by adjusting the settings of the program. You also have the facility where you can choose to let the program to disconnect the network connection once it has reached the set threshold. It’s a clean and simple tool that does not come with any viruses or spyware. When it comes to monitoring your computer’s network bandwidth, there can be no better application than BitMeter 2. This easy to use and free application allows you to keep a watch on your internet speed with the help of a floating graph. These graphs display the upload and download speed of your network connection that comes with simple text and is easy to follow. While it’s absolutely free of cost and the features are not time-limited, it is even free of any spyware and adware. It allows you to customize the color and transparency of the screen. Even though it’s a small sized application, it offers some really cool features and information. It displays a synopsis of the hourly, daily and monthly analysis of your network activity and even collects audio alerts which you can arrange by transfer dimensions and direction. Moreover, the built in calculator helps calculate the download and upload size and speed. Not just that, you can even set up manual or automatic backups of the application that helps recover activity history and settings, and configure the ISP Restrictions composition window effortlessly.